That is some couture collection Daphne Guinness has. Yesterday marked the opening of Daphne Guinness, at The Museum of the Fashion Institute of Technology in New York City, on view until January 7, 2012. The exhibit highlights the couture collection amassed by Ms. Guinness, one of the heirs to the Guinness brewing fortune, and includes approximately 100 garments and accessories, as well as short films by and featuring Guinness herself. 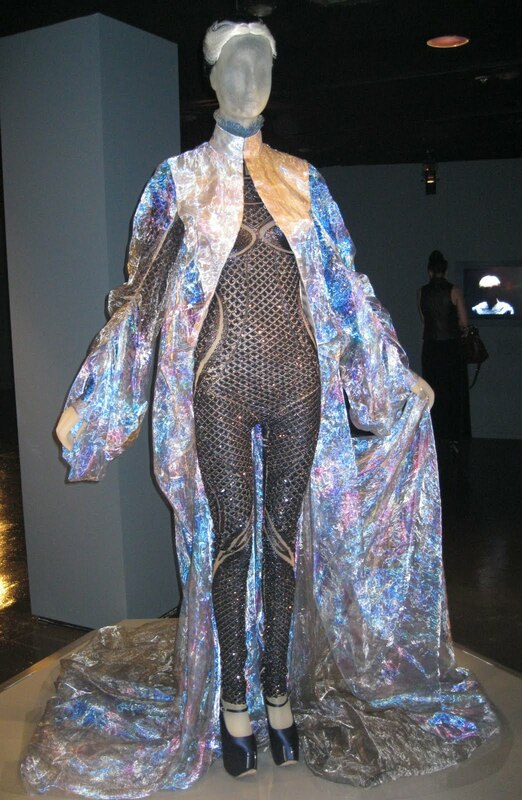 Ensemble by Alexander McQueen, featuring a gorgeous iridescent cape. 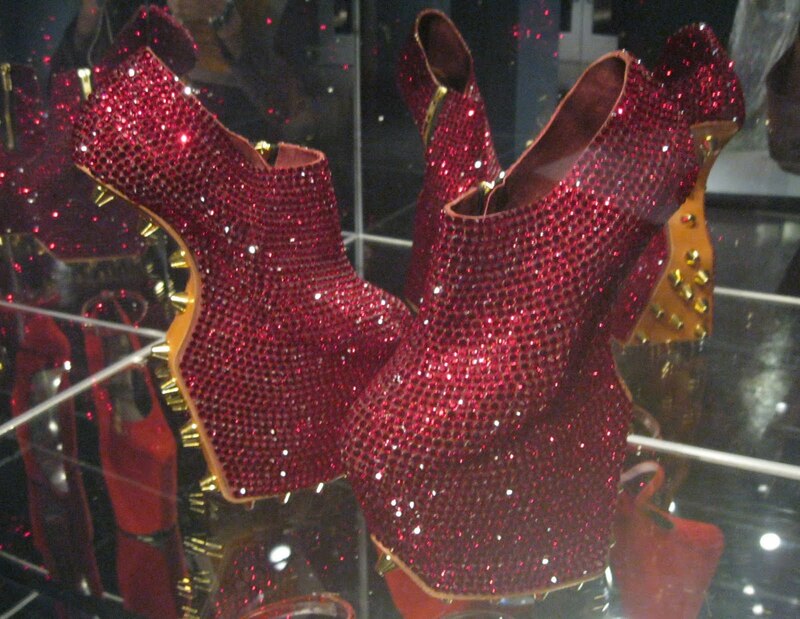 Heelless platform shoes made of red crystals and gold medal studs by Noritaka Tatehana. Organized into six sections, “Dandyism,” “Armor,” “Chic,” “Evening Chic,” “Exoticism,” and “Sparkle,” the show, co-curated by Guinness and Valerie Steele, director and chief curator of The Museum at FIT, offers a look into the never-ending fashion fantasy the combination of money and a profound love of the artistry of couture can create. 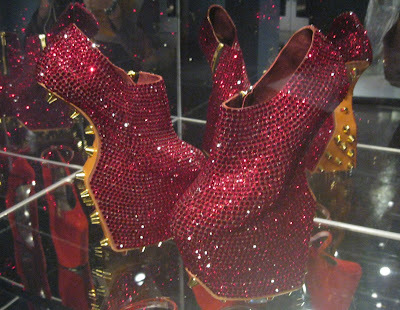 For those who missed the exhibit Alexander McQueen: Savage Beauty, you can consider this McQueen Redux, since there are many pieces by the late designer, a close friend of Guinness, a dozen of which have never before been displayed. 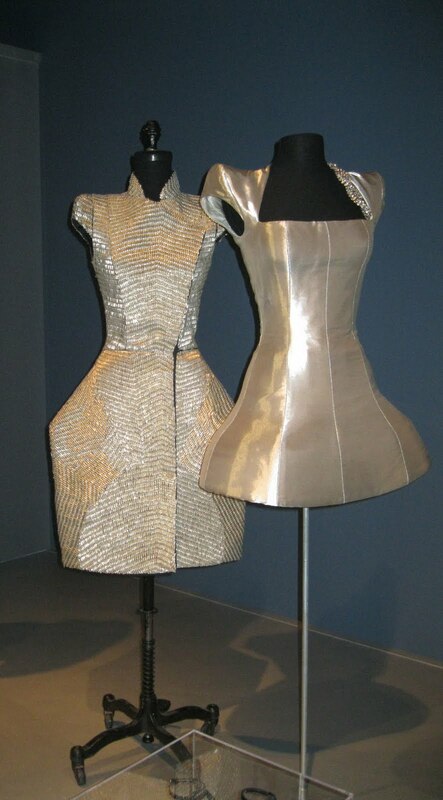 From the “Armor” section, two sculptural dresses by the late British designer Alexander McQueen. The exhibition’s design, by Ken Nintzel, is inspired by Guinness’s New York apartment, and from it I can only assume there must be mirrors everywhere in her house, reflecting her look from every angle. Suspended above all is the animated image of Guinness in a silvery catsuit, crowned with a diadem, a Statue of Liberty for the fashion-obsessed. 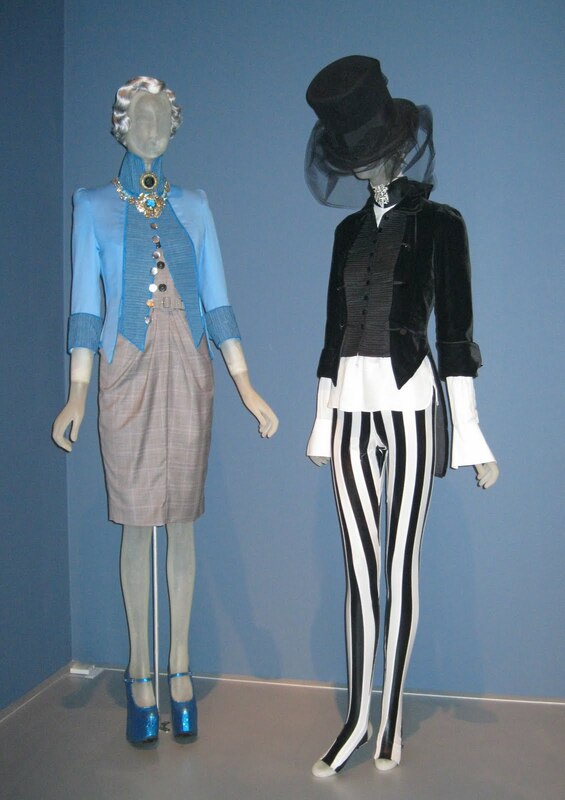 From the “Dandyism” section, with a focus on tailored pieces, blue jacket by Dior, black jacket by Daphne Guinness and pants from a London punk shop. 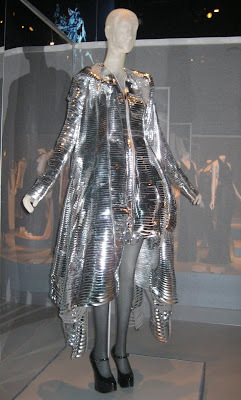 From the “Armor” section, dress and hooded cape of slashed metallic foil by Gareth Pugh, and heelless platform shoes of black patent leather by Natacha Marro. From the “Armor” section, jumpsuit and modified Nina Ricci boots of brown leather and rhinestones. Most of the pictures I see of Guinness in newspapers and magazines make her seem more the mother of Lady Gaga than the mother of Stavros, Alexis and Ines Niarchos, her three children by her ex-husband Spyros Niarchos, a Greek shipping billionaire. But in the quieter sections of the exhibit, “Chic” and “Evening Chic” especially, you learn the more extreme outfits Ms. Guinness veers toward, which garner the most attention, also have a counterpart: elegant clothing owned by a woman who appreciates the excellence couture provides—the best design, the best materials, the best workmanship. 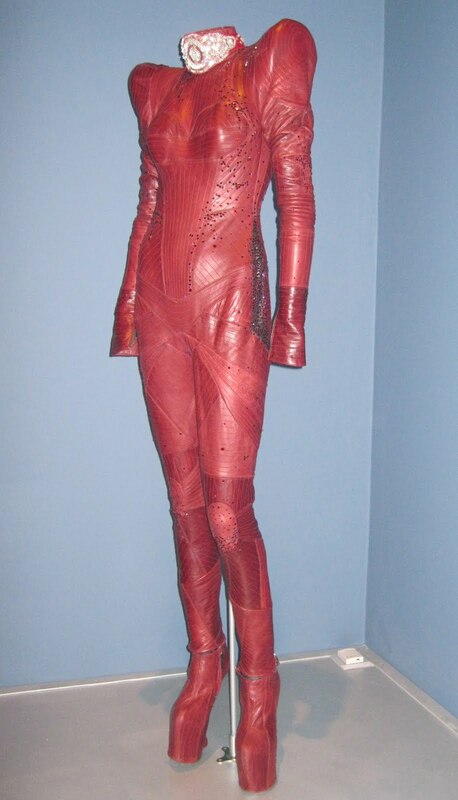 For those of you not inclined to wear, say, a leather catsuit with molded shoulders, you may find yourself understanding (and falling in love with) aspects of Guinness’s aesthetic in these sections of the show. Or maybe that’s just me and the fact that I am a mother myself. Catsuits I don’t understand. Catsuits I don’t do. But a gorgeous black dress with lace inserts by Alaïa? I’m so there. 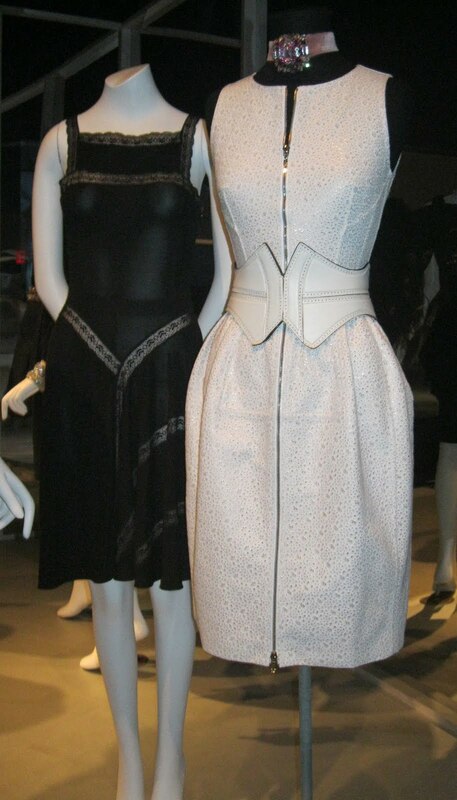 From the “Chic” section, black dress with lace inserts, white eyelet dress with leather belt, both by Azzedine Alaïa. From the “Evening Chic” section, a black Chanel dress and a pink Dior gown. 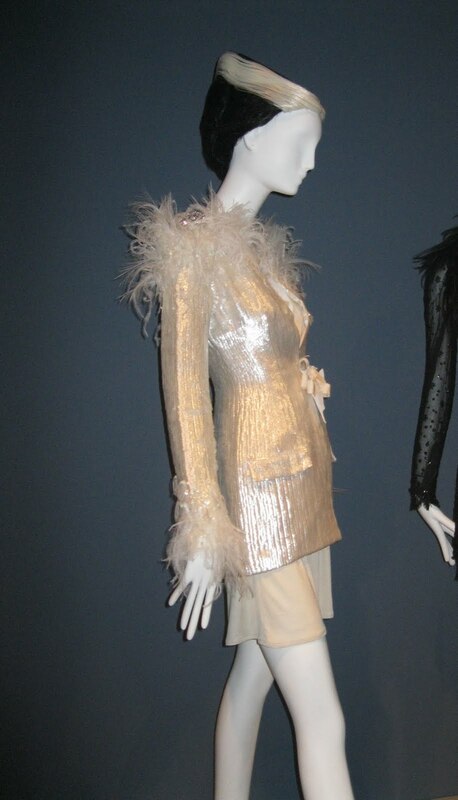 In the “Sparkle” section, a Chanel jacket of ivory sequins on silk net and white feathers. From the “Sparkle” section, catsuit and cape by Alexander McQueen, made of gold and bronze bugle beads and sequins on silk net, cape of black feathers. Because so many designers are on display in this exhibit, from McQueen to Karl Lagerfeld for Chanel, from Christian Lacroix to Valentino (and many others), for anyone wanting to get up close and personal with couture, this show is not to be missed. Best of all, admission to the show is FREE. A book accompanying the exhibit, Daphne Guinness, written by Valerie Steele and Daphne Guinness, will be available for purchase in October. All royalties from sales of the book will benefit the Fashion Institute of Technology. Come back soon, my next post will cover the remarks given to the press by Ms. Guinness and Ms. Steele, including a question posed to Daphne by me! 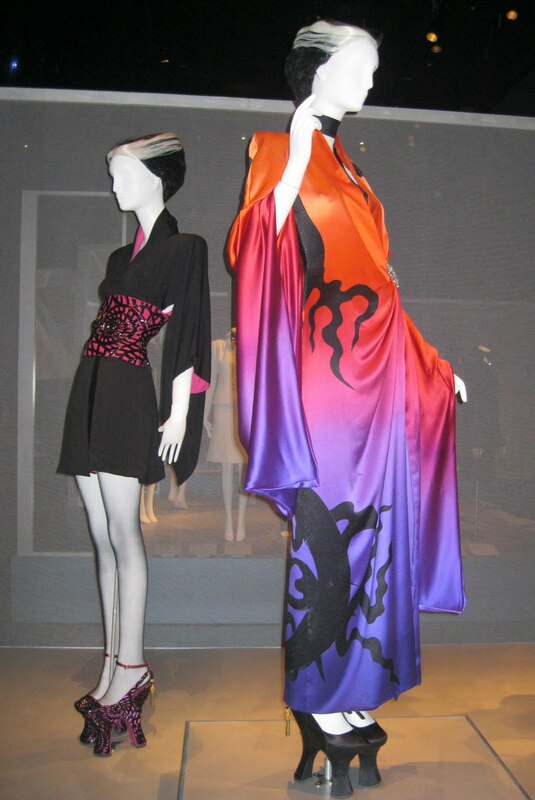 From the “Exoticism” section, two Japanese-inspired dresses and chopines by Alexander McQueen for Givenchy. I have always found her fascinating, and as a lover of fashion I am glad she has put her money where we all can enjoy. Thank you so much for sharing, my dear friend. As always...thanks for the tour Jill!! These are just beautiful. I have to go out to a fashion show alone and I wish you were here to go with me!! Gorgeous! She's such an inspiration to me! Ah, the "Chic" section kills me with beauty. The pink Dior gown, oh my, that is gorgeous. looks amazing...cannot wait to see this in a few weeks hopefully! great photos!! Nice post. She's so lovely, goodness! I want to take my eldest daughter, Rebecca to N.Y in Spring, but February would be very cold, so I thought perphaps April or may to may sure of making the most of a week. We will plan from December, so still early days. I hope to meet all you New Yorker bloggers soon, and have a superb party, yeahhhhhhhhhhh. Makes me want to drive down and see this exhibit. how utterly fantastic! When I see an exhibit like this, Its hard to think of outfits that are wearable--its so artful. And to see couture close up would be such a thrill--because I will never see it otherwise! Thanks so much, Jill! Hi Sacramento, this is exciting news, it sounds like you just may be coming next year to NYC, yay! February can be very cold, it's true, and we had a real winter last year. Keep me posted on details, I can't wait to meet you and Rebecca! 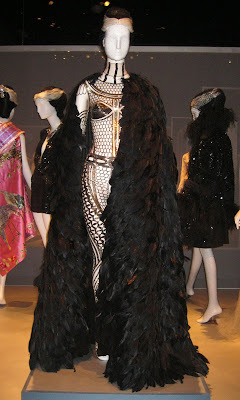 If you come after the first few days of May you will be able to see whatever costume exhibit the Met puts on display. As of this date no announcement has been made on what it will be, but no matter what it is, it's always worth the trip. Hi Pam, I wish I could've gone to the fashion show you mentioned and I wish you were here to attend the press preview of this exhibit with me, we would've had a great time together! 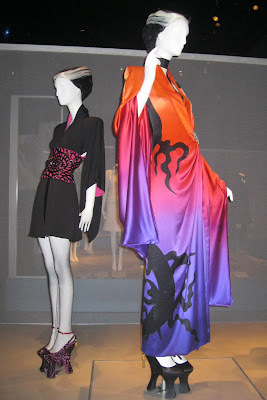 So much to love in this exhibit, and for me I think I connected to this show slightly more than the McQueen exhibit. Hi Plami, thanks for stopping by, and I know what you mean. Daphne just became a big inspiration to me too. Hi Patti! The "Chic" section really spoke to me. I could completely identify with these pieces, which were just quietly elegant and gorgeous. The "Evening Chic" too, just amazing couture clothes. That's when I realized there are two sides to Daphne, but that is not something you are hearing a lot about in the press. There is a focus on her more extreme wardrobe choices. Hey Rosemary, let me know what you think of this show. I'm especially interested in finding out how crowded it is. Hi Madison, thanks for stopping by, thanks for following! And you are right, Daphne is really lovely, in photos and in person! Hi Paula, are you in Boston now? If you are coming to NYC, let me know if you'd like to get together. I'd love to meet you. Most of the show is very artful as you say, but let me know what you think of the "Chic" section, that's the section where I really understood Daphne most of all. And really, it's nice to see a range of designers, and get a very close look at couture clothing. I came away from this exhibit wanting to go home and sew and sew and sew. what an amazing wardrobe and exhibition - you guys get the best exhibitions! Hi Veshoevius, so glad you are back, I missed you! I was kind of surprised by the location of this exhibit, I mean, why isn't it in London? I didn't realize until I watched a video that is part of the show, which features an interview with Daphne conducted by Vogue Italia, that she mostly lives in NYC, although she does maintain a London apartment. This looks like a wonderful exhibition! Great pictures. Hi Sylvia, thanks for stopping by and thanks for following my blog! I'm coming over to yours to see what you are up to. 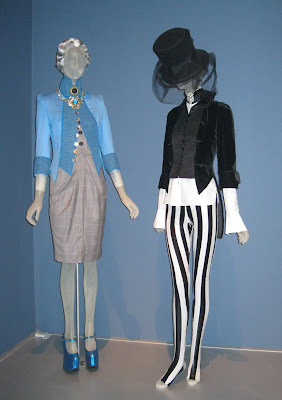 This Daphne Guinness exhibit is so good, I'm already thinking of when I can go back to see it. And I'm so curious to know if the turnout will be close to what happened at the Met with the Alexander McQueen show. A wonderful post! I also would have enjoyed the "chic" and "evening wear" section the most! Thank you for posting these pictures. Since I will not be able to see it in person, you have given me a virtual tour! Hi Sarah, glad to share these pictures with you, you have already returned the favor many times over with your wonderful pictures from the Paris exhibits I can't get to!